More recommendations by Transition Year pupils currently writing their Extended Essays. This is one of my favourite series. The book is set in Mongolia and this book follows Ogedai Khan trying to rule the empire. 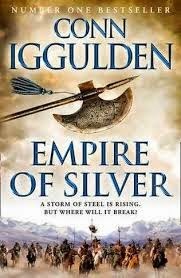 The book has a good plot, interesting characters and massive battles which were not just interesting to hear about because of the fighting but also how they used stratefies. Another note thing I liked was its degree of historical accuracy (there was an author's note in the back which noted any deviations). I really enjoyed this book and somtimes found it hard to stop reading. My book is about discrimination of gay people in the sixties. The book is about a lawyer who is fired because he has AIDS and is gay. He decided to fight against his law firm and a homophobe helped him. I read this book in one day because it really caught my attention and I enjoyed reading it. I laughed and cried and felt with the main character, and the style of writing is easy to read.